Burke Mountain may be Vermont’s best kept secret for skiing. 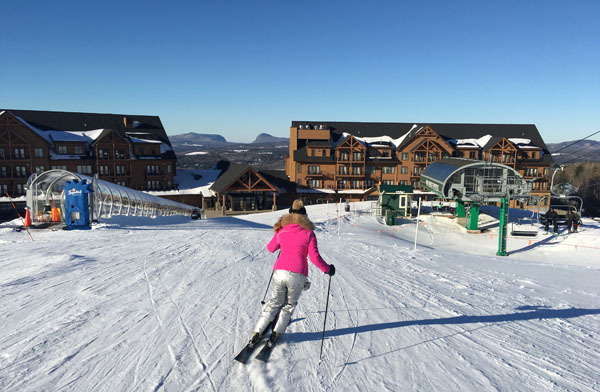 While it made financial news recently, this ski gem in the Green Mountains remains as one of the least crowded, best skiing and most picturesque ski mountains in New England. Here are reasons you should ski Burke with your family. Burke Mountain’s terrain is classic, great pitch from the 3,297’ summit, served by two overlapping high speed quads. Burke is legendary among “real skiers” as a great race hill, churning out Olympic caliber racers since 1956. You’ll pass Burke Mountain Academy, Mikaela Shiffrin’s Alma Marter and 30+ Olympic skiers, oon your way up the mountain road. The skiers’ mountain remains true, Burke Mountain has 2,011’ vertical of consistent pitch, with interesting narrow trails like The Shoot, Power Line and Doug’s Drop, and classic fall line carvers like Willoughby, Warren’s Way and Big Dipper, plus 100-acres of beautiful glades like Birches and the Jungle. The Burke Mountain Hotel is beautiful, the most under-marketed luxury ski hotel in the East. Despite the misappropriation of significant EB5 funds (understatement), Burke did benefit from this new luxury hotel at mid-mountain. No expense was spared on this alpine hotel, complete with 116 ski-in ski-out suites, most have decks, stone fireplaces and gorgeous views of the ski slope or Willoughby Gap. The Hotel has all the bells and whistles, a decadent outdoor pool and steamy hot tub, a choice of dining casually at The View Pub or Willoughby’s Restaurant, plus there’s a Café and Vertical Drop Retail Shop, fitness center, game room and ski lockers, all within steps to the slopes. The Burke Mountain Hotel was well-designed, with top end tile, woodwork and amenities, beautiful photographs of Vermont’s great outdoors, just disregard the Q carved into the fireplace mantel. This season, the brand new Burke Mountain Hotel ski and stay packages are a deal. Get your #Selfie at Burke, this ski area feels more private than some private ski resorts Hermitage Club and Yellowstone Club. Burke has a very low skier density count, among the 37 trails and 14 glades. On a holiday weekend, we were among about 178 skiers and snowboarders, one per acre, enjoying solo trails and non-existent lift lines for the swift detachable chair rides back up Burke Mountain. We did 5 laps per hour with ease at Burke. The Vermont factor: picture Burke as the Green Mountain monadnock with pinnacle views of the incredibly pristine North East Kingdom, NEK, of Vermont. Every turn, every chairlift, offers extraordinary scenes. The most dramatic is Willoughby Gap to the North, the distinct Hor Mountain (pronounced as you’d feared) and Mt Pisqah that perfectly frame Lake Willoughby the deepest glacier lake in Vermont. Burke’s lower mountain is a learner’s paradise, gentle rolling wide boulevards grace the bottom third of the mountain, appropriately named Bunny Lane and Meadow Pass, served by the Sherburne Express Quad, a magic carpet and JBar. Parents can watch proudly from the 2nd floor Tamarack Pub with Vermont-crafted IPA in hand as their kids learn to turn in Burke Snow Sports camp or on special sledding nights. Burke is a fun mountain. You’ve got earthy locals living in Lyndonville and East Burke that come out to ski in woolies with big smiles, and you’ve got a few folks from away, condo owners. The Bear Den in the rustic Mid-Burke Lodge is authentic Vermont après ski down to the vintage ski swag, a real wood fireplace, Flaming Eddy shots and PBR pounders. Here you will meet the natives and the ski racer parents who pour their heart soul, and wallet into this mountain. Burke is a bargain compared to others. With lift tickets at $64 a day, and specials galore, like $25 Sunday afternoon skiing, you get a lot of Burke for your buck. Stay in the top shelf Burke Mountain Lodge in a studio suite for $223 a night including lift tickets for two. Ski Burke because you can, easy to reach and affordable, while you can. There’s no telling what will happen to this humble ski area. Burke is in receivership currently. Having had more than its share of owner in the past, five in 25 years, and almost as many bankruptcies, Burke’s roller coaster days aren’t over. What remains sure is Burke has some of the best ski terrain in Vermont. As part of your Burke ski vacation, take the kids sledding, dog sledding, snowmobiling or ice fishing in The Northeast Kingdom. In summer, Burke is very popular for its mountain biking trails with its own Burke Mountain Bike Park and its partnership with the extensive Kingdom Trails Association.